While the handsets are still on track to launch September, Apple's 2017 iPhone lineup— led by an anticipated high-end OLED model— is rumored to go into production earlier than the usual timeframe, in a move that could allow the company more time to iron out kinks associated with new technology. Citing its usual sources in the supply chain, DigiTimes reported on Friday that Apple has asked its chip and component suppliers to start trial production and inspection and begin preparing their inventories for this year's new iPhone series at an earlier point in the year than usual. Specifically, parts and chips are expected to be delivered to Apple late in the first quarter of 2017. 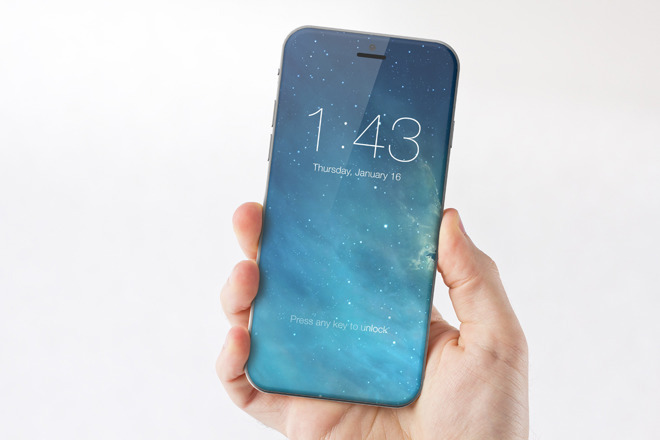 In particular, Apple is rumored to be looking to get a head start on the "iPhone 8," which is rumored to introduce a wide array of new technologies, headlined by an edge-to-edge OLED display. The report suggested that suppliers in Taiwan will begin working on OLED panel bonding for the "iPhone 8," with screens provided by Samsung Display, around the end of the first quarter. Supply chain sources suggested that Apple has implemented stricter inspection requirements for chips, components, modules and mechanical parts for its 2017 iPhone lineup. That would suggest that Apple could be using the extra time to make sure the new technology in this year's iPhone lineup will arrive in the hands of customers with minimal to no issues. Finally, Friday's report also reiterated claims that the "iPhone 8" or "iPhone X" will boast wireless charging and an iris scanner for secure logins via camera. It suggested supply chain sources are "generally optimistic" about how well it will be received by the market. Still, details from the report— including the continued expectations that new iPhones will stick to a September launch —align with current expectations. Apple is heavily rumored to debut three new iPhones later this year in September, headlined by a premium "iPhone X" that could cost more than $1,000. It's expected to boast a glass back and curved edge-to-edge 5.2-inch OLED display that will conceal components like the earpiece speaker, Touch ID and FaceTime camera beneath the screen. In addition, Apple is also expected to launch successors to the iPhone 7 series in similar designs, sized with the same 4.7- and 5.5-inch screens. It is rumored that those handsets will stick with LCD technology for their displays, while the OLED iPhone will have a "considerably better" panel, helping to justify its jumbo-sized price tag. According to well-connected analyst Ming-Chi Kuo of KGI Securities, all three 2017 iPhones will feature wireless charging technology, though the OLED model will need a new thin graphite sheet component to prevent overheating.